This Scottish Cooking page has some of the top recipes from Scotland provided by leading chefs in top hotels and restaurants. They include Scottish food recipes and Scottish dishes from Andrew Fairlie the Michelin Star chef at Gleneagles Hotel restaurant who is pictured to the left. These modern Scottish cooking are in this special section because they represent a new generation of meals that use healthier ingredients and modern methods when compared to the more traditional meals throughout the website. These Scottish dishes have easy to follow cooking directions and include full colour high resolution photographs taken by the chefs and their teams. Ingredients used have been locally sourced. If you would like to submit your own recipes from Scotland to be included then please Contact Chris. Please include a list of ingredients and step by step cooking instructions along with a photo of the cooked dish if possible. Please also include details of how you would like your acknowledgement to read along with information that we can direct our visitors to for more info such as a website or restaurant address and telephone number. The Mackerel Recipe comes from the Fishy Fishy restaurant in Brighton, England. The modern Scottish cooking recipes further below use some of the freshest Scottish food ingredients such as haggis, honey and raspberries. They have kindly been provided by Sainsbury's as part of their Eat Britain campaign to encourage UK shoppers to buy local produce. The Eat Britain campaign by Sainsbury's was launched by Glasgow lass Jenni Falconer who many may recognise as the travel expert on GMTV. During the campaign Jenni travelled to places such as Inverness to visit the Champion Regional Organic Chicken farmer. In the photo below Jenni Falconer is pictured with Willie Lean from Croy in Ayrshire. Willie farms 55,000 organic chickens and they enjoy a unique and luxurious lifestyle in holiday homes! Jenni was also joined by local lady and member of the Sainsbury's Try Team, Cathy Burns who cooked up some great dishes. These are linked further below and include kebabs, haggis stuffed chicken, baked goujans and hot chicken and raspberry salad. The Try Team are a team of twelve women from across the country who are helping get the nation cooking. Nearly half of people (46%) will not change their eating habits at all - for example asking for fish and chips when holidaying abroad. An estimated 37 million Brits will holiday on British soil this summer - they have been nicknamed "staycationers". Despite a wealth of culinary delights, two thirds of Brits staying in the UK will miss out on the delights of eating regional specialities. Sainsbury's hope to encourage the UK population to try regional British foods this summer and �Eat Britain�. 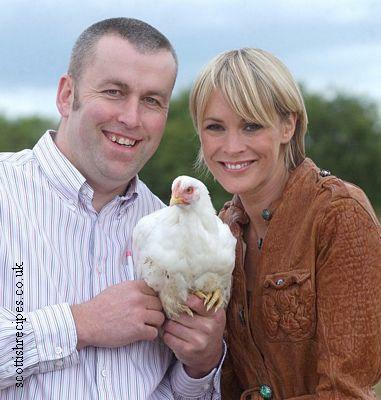 Jenni Falconer, says: As a real food enthusiast, I�m a big believer in supporting regional farmers, which is why I am proud to be part of the Sainsbury�s Eat Britain campaign. To encourage all those holidaying in the UK this summer to try some of the great regional produce available, I�m heading up to meet Willie Lean and his team who supply Sainsbury�s with delicious British organic chicken. Recent research released by Sainsbury�s reveals Scots are proud of their regional foods voting Aberdeenshire as deserving the title of �food capital of the UK,�. Just under a third of all those questioned voted the home of the highland Salmon as the nation�s culinary hotspot. Sainsbury�s works with over 17,000 British farmers and suppliers who produce a wide selection of food to its 800 stores nationwide. They have integrated Scottish cooking and recipes from Scotland into many of their exclusive meals, some of which are shared further below. Jenni Falconer is not the only high profile celebrity to share a passion for British cooking. She is joined by actress Gaynor Faye, Blur musician and now farmer and cheese maker Alex James, broadcaster Colin Murray and presenter Judith Chalmers. The celebrities will travel to holiday hotspots around Britain, visiting Sainsbury�s suppliers to sample first hand the variety of regional produce available to staycationing Brits this summer. Judith Batchelar, Sainsbury�s Director of Brand, says: We want to help put British food on the map this summer and encourage our customers to celebrate the array of food choices that Britain has to offer. Whether that�s rediscovering the delights of Cornish clotted cream ice cream that you remember from your childhood or trying something new, like one of our many fantastic cheeses from small regional suppliers, there is something for everyone holidaying at home this year.